XYZ CARGOs use a completely new way of building functional cycles with a focus on local production in a socially just and environmentally sustainable way. and we will ship it directly: Or you can write us and book a time to build it yourself at our workshop in Copenhagen or Hamburg with assistance from us. 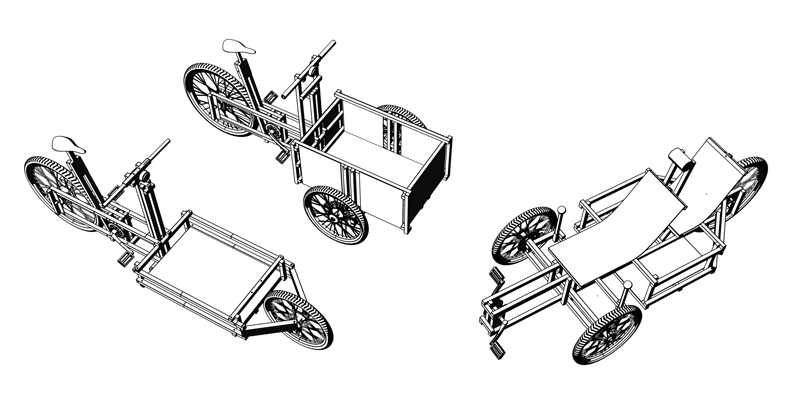 The XYZ CARGOs are based on an Open Source construction system called XYZ SPACEFRAME VEHICLES. Read more about that further down. XYZ CARGOs combine bolted, modular and simple orthogonal construction methods with the use of advanced 3d design tools. XYZ CARGOs are easy to customize and to rebuild. It encourages DIY ingenuity and participation instead of rigid predefined solutions. XYZ CARGOs can easily be repaired and with proper maintenance of mechanical parts it can last a lifetime. For an effective recycling process, all parts can easily be separated into useful modular parts or basic raw materials again. XYZ CARGOs more than matches any existing, comparable, mass-produced, standard products – both regarding quality and low price. The ambition that powers the development of XYZ CARGOs and XYZ SPACEFRAME VEHICLES exceeds the mere ambition of building bikes and trikes: We want to change the way we move things and persons, the way we produce things, the way we share and distribute things, the way we live. We want to contribute to creating a better and more fair world. 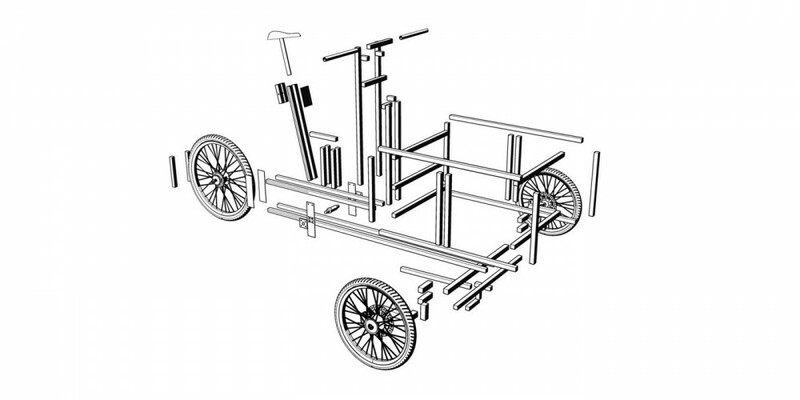 The XYZ CARGO TRIKE, the XYZ CARGO TWOSEATER and the XYZ CARGO BIKE has been developed as products for sale and no construction drawings are available. The construction drawings for the XYZ ONESEATER can be downloaded for free here. You can of course still copy the commercial models for your own non- commercial use according to the CC license. However please respect that we don’t have the time to facilitate or advise on self building-projects. People interested in details of the building process are asked to take part in one of our workshops. Fair pricing: We ask ourselves how to give access to XYZ CARGOs to as many people as possible and how to do this in a fair and symbiotic way. We wouldn’t try to get the biggest profit, but balance a fee for our work with the costs and the time we have invested. All persons should be able to access XYZ CARGOs in a way, that fits both: their means and their needs. We offer a range of ways to get hold of a XYZ CARGO: we sell readymade, assembled cycles and we arrange workshops for those who want to build their XYZ CARGO themselves. Finally people can also build their XYZ CARGOs from scratch on their own, according to the Creative Commons license above. However we do not give away blueprints for the commercial models. All ready-made XYZ CARGOs are produced locally at our manufacturing studios in Copenhagen and Hamburg – according to socially fair and sustainable production principles. Each XYZ CARGO is hand-made and can be tailored to the needs of the user. Earnings from the sale of the XYZ CARGO´s are used to finance the further development of XYZ SPACEFRAMES VEHICLES Manual and other N55 projects.